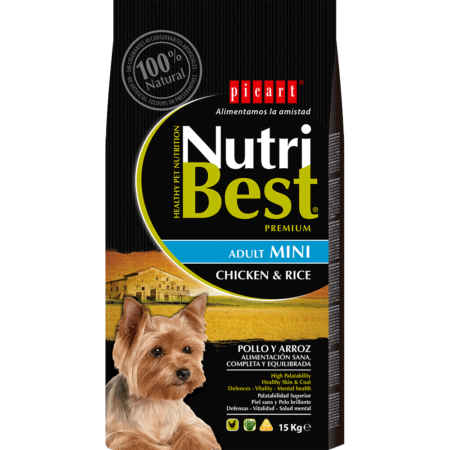 Dogs with tendency towards overweight need an special feeding purposes, adapted to its needs: punctual weight control and its subsequent maintenance, together with the vitamins and minerals needed for looking after their health. 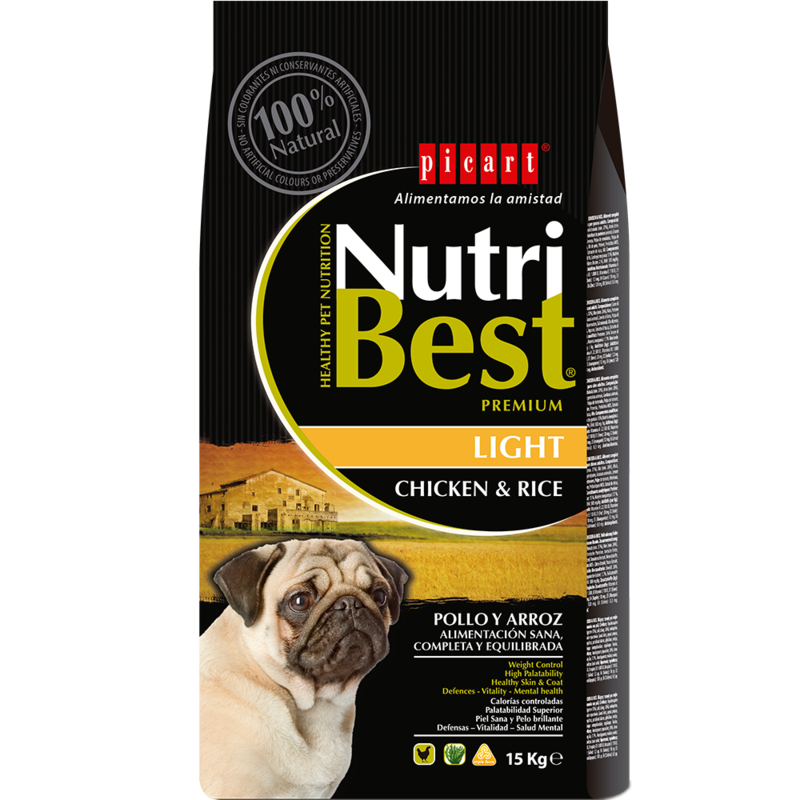 NutriBest Light is a Premium pet-food devised by our experts in nutrition and vets so that your dog grows healthily and full of life whilst enjoying ideal health. It contains Marine Algae from the North Atlantic for healthy and cared for coat and skin. Brewer’s Yeast, rich in vitamins from the B Group, aids to regulate the metabolism and the production of blood glucose to increase your dog’s energy and vitality. 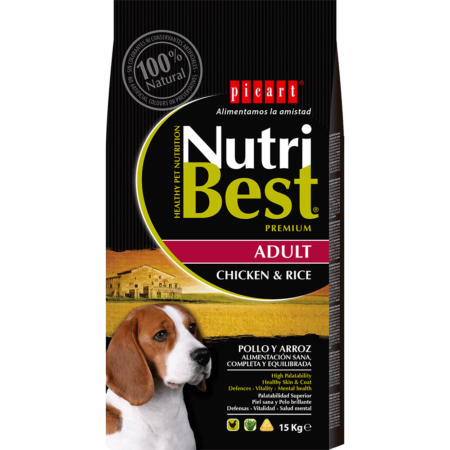 It contains a lower level of fats to help reduce body weight, and later to maintain it. 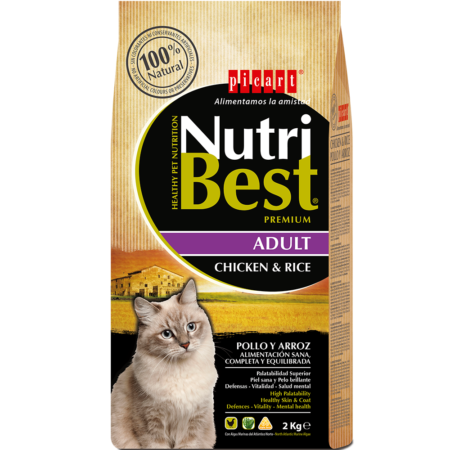 Meat and animal by-products (25%) (4% Chicken meal); Wheat; Maize; Barley; Wheat middlings; Carob; Soia; Rice (4%); Oils and fats (0.5% Fish oil); Brewers yeast (1%); Beet pulp; Algae from North Atlantic (0.5%); Minerals; Prebiotic MOS; Yucca extract. Crude protein: 24%, Oils & fats: 7%, Inorganic matter: 8%, Crude fibres: 3.8%.